Over 100 people gathered at the Ukrainian Catholic Church in Coventry to commemorate the 75th anniversary of the Holodomor. Neighbouring communities of Rugby, Leicester and Wolverhampton were also represented. 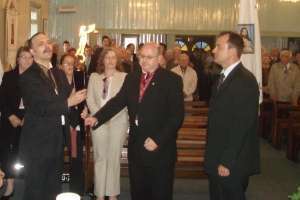 The Holodomor torch of remembrance was passed over by AUGB president Zenon Lastowiecki to branch Chairman Roman Leszczyszyn. 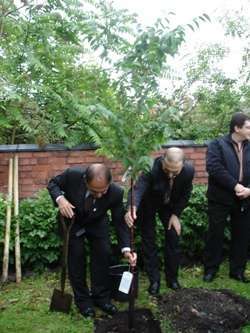 The service was conducted by o. D. Senyk and o. M. Matwyjyvski. Also present at the service were Askold Lozinsky, president of the World Congress of Ukrainians and Vladislav Rohovy from the Ukrainian Embassy. 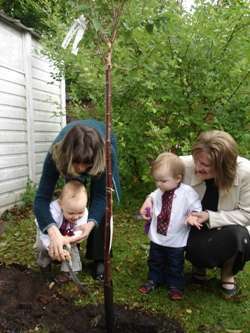 After the service two flowering cherries were planted in the Church gardens in memory of those who died, by Askold Lozinsky and Roman Leszczyszyn as well as the youngest members of the community Maxym Hnativ and Luka Greshko who were helped by their respective mothers.